This week onÂ The Urban Business Roundtable, Dwyaine Betts Jr. talks withÂ Shawn Buchanan, the president and CEO of Omaha, Nebraska-basedÂ All American Meats Inc., one of the nation’s largest Black-owned businesses. With 2012 revenues of $62 million, All American Meats is ranked No. 46 on theÂ Black Enterprise 100s list of the nation’s largest Black-owned industrial/service companies. A former professional baseball player–he played the outfield for his hometown Chicago White Sox–Buchanan began planning for his career after pro sports as a business manager at Nebraska Beef, a beef processing company. When he retired from baseball in 1996, he launched All American Meats. 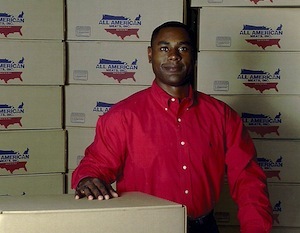 Within five years, Buchanan made his presence as an entrepreneur, earning a Black Enteprise Small Business Award in 2000. He’s also earned special recognition for the U.S. Department of Agriculture, among other industry awards. Also, UBR ContributorÂ Samantha Pass talks withÂ Stacia Pierce, founder and CEO of LifeCoach2Women.com, about how to emotionally recover from episodes of failure. Pierce is founder of the International Women’s Success Conference, which has attracted thousands of women annually over most of the past two decades. She’s also an entrepreneur, including owning an online jewelry store. And finally, every week on UBR, you’ll hear Pepper Miller’s Y.O.U.-TURN segment, get motivation and inspiration from author and educator Dr. Dennis Kimbro, a wrap-up of tech news from the chief digital aggregator for Johnson Publishing Company Jun Mhoon, and our Patient Investor Report from Ariel Investments. Pepper Miller is the Founder and President of The Hunter Miller Group and the host of The Urban Business Roundtable, a weekly radio show, sponsored by Ariel Investments, airing CST Wednesdays at 8:30 a.m., Thursdays at 6:30 p.m. and Saturdays at 9:30 a.m. on WVON-AM 1690, the Talk of Chicago. You can also listen live online at WVON.com. Check back each week for UBR Spotlight, which features additional resources, advice and information from and about the topics, entrepreneurs and experts featured on the show. If you have a question you want answered or a topic you want addressed on The Urban Business Roundtable, connect with us on Twitter @UBR1690. Take your business to the next level at the Black Enterprise Entrepreneurs Conference hosted by Nationwide, headed back to Columbus, OH, May 14—March 17, 2014, at the Hyatt Regency Columbus. Hundreds of small business owners, executive leaders and dealmakers will be in attendance to build networks, land new business and learn from some of America’s most successful entrepreneurs–including TDJ Enterprises CEO T.D. Jakes! To learn more, go to BlackEnterprise.com/ec and check the hash tag #BEEC2014 on Twitter and other social media sites! Pepper Miller is the Founder and President of The Hunter Miller Group and the host of the Urban Business Roundtable, a weekly radio show, sponsored by Ariel Investments, airing CST Wednesdays at 8:30 a.m., Thursdays at 6:30 p.m. and Saturdays at 9:30 a.m. on WVON-AM 1690, the Talk of Chicago. You can also listen live online at WVON.com. Check back each week for UBR Spotlight, which features additional resources, advice and information from and about the topics, entrepreneurs and experts featured on the show.